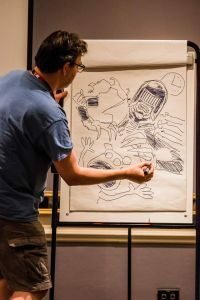 You are here: Home » MEDIA » Cons » Lawgiver Mk IV Convention, Bristol, Saturday 26 May 2018 (convention report). Lawgiver Mk IV Convention, Bristol, Saturday 26 May 2018 (convention report). I’ve been a fan of cult British comic ‘2000AD’ and its most recognisable character, the 22nd century lawman Judge Dredd, since August 1977, when one of my elder brothers bought the eight-year old me a copy of the 29th issue, soon after our family returned to the UK from the army base in West Germany where we had been living for the previous three years. The SF stories that ran in ‘2000AD’ were unlike anything else I’d ever read before and I devoured them every week for the next ten years, until it was time to go to university, where other priorities beckoned. Fast forward a quarter of a century to 2012. When the grittily authentic film ‘Dredd’, starring Karl Urban in the title role, was released in cinemas, my love for ‘2000AD’ in general and Judge Dredd in particular was resurrected immediately. I’ve been reading ‘2000AD’ again ever since. Many of the characters have made a deep impression on me over the years but none more so than Judge Joe Dredd, the ultimate example of devotion to duty even if the consequences, in human terms, are sometimes horrendous. 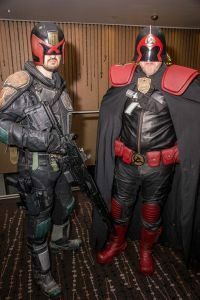 Having attended and hugely enjoyed ‘2000AD’s 40th anniversary convention in London in February 2017, I was extremely excited to hear about the fan-organised Lawgiver Mk IV convention, named after Dredd’s iconic gun, taking place at the Doubletree by Hilton Hotel in central Bristol in late May this year and I jumped at the chance to file a report for SFCrowsnest on what happened at it. I should record my thanks to Su Haddrell and the rest of the convention’s organising committee for offering me a press pass for the event. The morning of Saturday 26 May saw me travelling one hundred miles west from Bucks to Bristol in the company of my twin brother, Dominic, also a big JD fan. Once we’d arrived and parked, the people on the Con registration desk were very welcoming and friendly and we felt right at home immediately. We had enough time for a quick wander round to get our bearings, suss out where the various meeting rooms were and have an initial look at some of the merchandise stalls, before heading into ‘The Interrogation Room’, for what was undoubtedly one of the highlights of the programme, an interview with legendary early Dredd artists Mick McMahon and Ian Gibson. This hour-long session was split in two, the first half consisting of an interview with both artists, led by moderator Mick Ramsey of the wonderfully-named Dredd Screening Drinking Club or DSDC, followed by half an hour of Q&A with the audience. 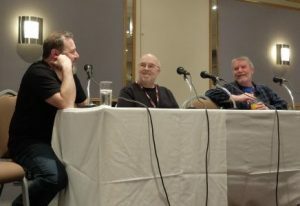 We heard many fascinating insights into McMahon and Gibson’s work on Dredd, on other ‘2000AD’ strips and, more generally, as well as some hilarious anecdotes and gossip and finally several pieces of concrete advice for aspiring comics artists. I was lucky enough to get to ask a question during the Q&A. I asked what the best and worst things about drawing Dredd had been? Gibson had no strong views, but McMahon did. For him, the best thing was that you never knew what the next script would contain. The worst was when a script called for a huge group of judges, as that took ages to get right. 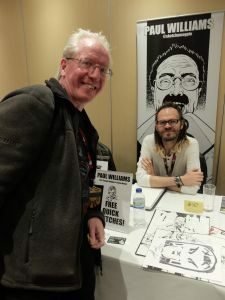 It was wonderful to revisit the early history of ‘2000AD’ through the eyes of two such iconic Dredd artists and I was utterly amazed at how humble Mick McMahon remains after all these years, even though his interpretation of Judge Dredd is widely recognised as one of the most iconic ever to appear. Following that, Dom and I took to the dealers’ room for an early chance to spend some money. I was quite restrained, which still amazes me weeks later, as there was an awful lot of merchandise available, including signed original artwork from Judge Dredd artists, art prints of all kinds, several fanzines, lots and lots of comic back issues and, for those with large wallets, an extraordinary array of props and memorabilia from the wonderful people at Planet Replicas. If you’ve ever wondered what you’d look like wearing Judge Dredd’s helmet and uniform or pulling his Lawgiver out of your boot holster, these are the people to go to. 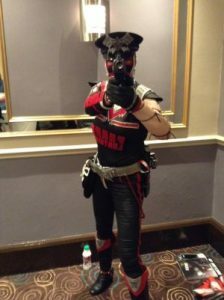 Speaking of uniforms, there were a lot of cosplayers at the Con. Most were dressed as judges, of course, although even then we had Mega City Judges, Brit Cit Judges, Sov Judges, Dark Judges and more besides. On top of that, we also had many other characters from the ‘2000AD’ universe in attendance, including Strontium Dog, Durham Red, Marshal Law and such wonderful oddities as The Synthetti Man, a waiter carrying a creature made of spaghetti, which featured in a Judge Dredd story back in 1981! It amazes me the amount of effort that people make to get their costumes just right, and they certainly added hugely to the atmosphere of the event. After lunch, we went to a panel about the impact of technology on the work of comic artists. 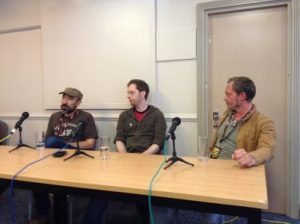 The three panellists were Lee Carter, Ryan Brown and Clint Langley, all of whom have portrayed Judge Dredd for ‘2000AD’, as well as working on many other characters and comics. Most of the discussion centred around the similarities and differences between producing physical artworks with traditional media and digital artworks on a computer. The panel were all very open and generous in discussing how they work across both methods, the pros and cons of each and the reality that digital art programmes are just another tool which cannot replace the need for talent, creativity, originality or hard work. This was my favourite session of the day, because it was held in a smaller room and felt much more informal and intimate, much like having a chat with all three artists down the pub! The next session we went to turned out to be our comic relief for the day, as we went to the ‘Draw off’ in the main room, where Dredd artists Henry Flint and Mike Collins had to draw a succession of strange and surreal pictures to order, within a couple of minutes, in response to a series of random prompts from the audience. The resultant pictures, which were simultaneously bizarre and hilarious were then raffled off to those present, with several lucky people walking off with signed originals that were totally unique. Dealers’ room: me with Paul Williams and you can see the sketch of Judge Dredd that he had just drawn for me on the table in front of me. During the final coffee break, I was lucky enough to get talking to Paul Williams, one of the artists who had taken a table in the dealers’ room. Paul won the art talent competition at the Thought Bubble Comic Convention in Leeds in 2017, the prize for which is an opportunity to draw a strip, written by Laura Bailey who won the script talent competition, which then appeared in Prog 2072 of ‘2000AD’ in March this year. Paul is a long-time fan of ‘2000AD’ and his excitement and enthusiasm about the opportunity he has been given were infectious. 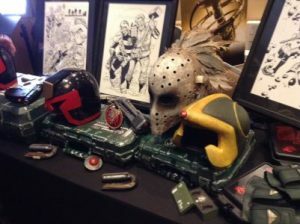 I was extremely grateful to him for creating an amazing sketch of Judge Dredd for me, right in front of my eyes. Watching an accomplished artist transform a blank sheet of A4 into a detailed and dramatic portrait of your favourite comic character in a matter of minutes is an amazing experience. I was supremely impressed by the speed and quality of Paul’s work. If you have a look at his website (www.sketchymagpie.com) you’ll be able to see what I mean. The last event of the day was a screening of ‘Search/Destroy’, a recent fan film featuring another of ‘2000AD’s iconic characters, Strontium Dog. The link here is that the same production team made a Dredd-related fan film, ‘Judge Minty’, back in 2013. Both are impressive pieces of work, considering the constraints that any fan film is made under, and are well worth watching on You Tube. However, getting a chance to see ‘Search/Destroy’ on a projection screen, surrounded by an audience of appreciative fans, was an unforgettable experience and a wonderful way in which to end the main proceedings. When the film finished, Con organiser Su Haddrell got up to give a round of thanks to all those who had made the day such a success, before sharing the news that next year’s convention will be slightly different, as they will be broadening the scope beyond Judge Dredd or even ‘2000AD’ to become a celebration of the whole of British comics. If you’re interested in finding out more, check out the ‘Lawless’ group on Facebook for details. I’ve only been to a few genre conventions in my time and I must admit that I tend to prefer the smaller, more intimate ones to the large ones with thousands of attendees. The Lawgiver MkIV Convention definitely falls into the former category and qualifies as one of the friendliest and most enjoyable events I’ve been to in a long time. Many thanks to Su Haddrell, the rest of the organising team and all the artists and other special guests for making it such a brilliant day. « Editorial – August 2018: Gameplay the geek way.